Editor’s Note: It’s Our 2nd Year Anniversary! Not too long ago, I set out to establish a publication unlike any other in Nigeria: a dedicated health magazine. The idea was born primarily out of my family’s experience with my father’s health struggle in Nigeria, the lack of credible sources of health information geared toward Nigerians, and my dissatisfaction with the one-dimensional media portrayal of health issues in Africa. In addition to giving a voice to these incredible women, each issue of Radiant Health has explored a wide variety of social and cultural issues affecting Nigerian women’s health. These pieces have included our three-part series on medical negligence and an in-depth look into the sexual health of our youth. I am proud of these achievements, and equally proud of the women (and one man!) who have graced our covers thus far. For me it is both an honor and a testament to our commitment to quality that the likes of Uzo Aduba, Millen Magase, Zain Verjee, Somi, Davido, and in this issue Osas Ighodaro Ajibade, all have trusted us enough to appear on the cover of Radiant Health. And stay tuned, because we have a guaranteed lineup of outstanding African women set to appear on our cover in upcoming issues! None of this progress would have been possible without you. I’m deeply grateful — thank you. 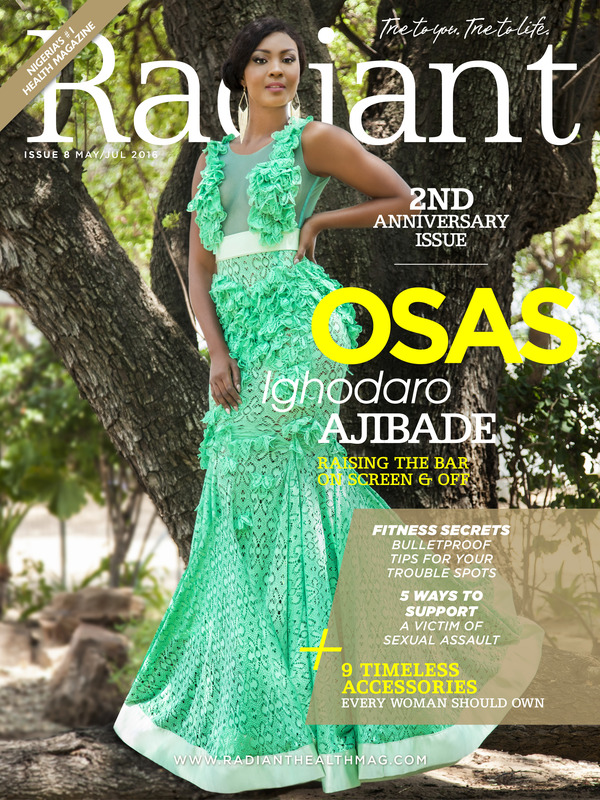 This anniversary issue is a must-read, featuring the beautiful and talented Osas Ighodaro Ajibade. Her on-screen star just keeps rising, but she’s an amazing woman off-screen as well, especially when it comes to her humanitarian work. After losing her pregnant sister to malaria, Osas has been a tireless force in raising malaria awareness through her nonprofit organization. In our interview, Osas shares with us how she manages to keep it all together and the mantra that has propelled her rise to the top. I truly hope you enjoy this wonderful issue we’ve put together for you! Radiant Health exists to be your ultimate guide to healthy living no matter where you reside on the globe. As we journey into year three and beyond, I encourage you to continue engaging with us — spread our message far and wide, and let us know how we can better serve you to make your lifelong health journey a successful one.